Perhaps no other plant in the garden tells the story of Wondrous Gardening more than Tithonia rotundifolia. One of the few annuals found in my garden, Tithonia is a pollinator powerhouse. I start Tithonia by seed under grow lights in March, and set out in the garden in mid-May after the last chance of frost. Once in the ground, seedlings virtually explode with growth and vigor, quickly reaching 4 feet tall by June and towering to 6 feet by August. Yes, you’ll need a big, sunny space if you want to really appreciate Tithonia. By end of summer, one plant can exceed 7 feet in height and 4 feet in width. Plants develop strong lateral branching and produce delightful, orange daisy-like blooms. In southern NH, the “Tithonia Show” begins around July 4th and doesn’t end until late October, or whenever we have our first killing frost. 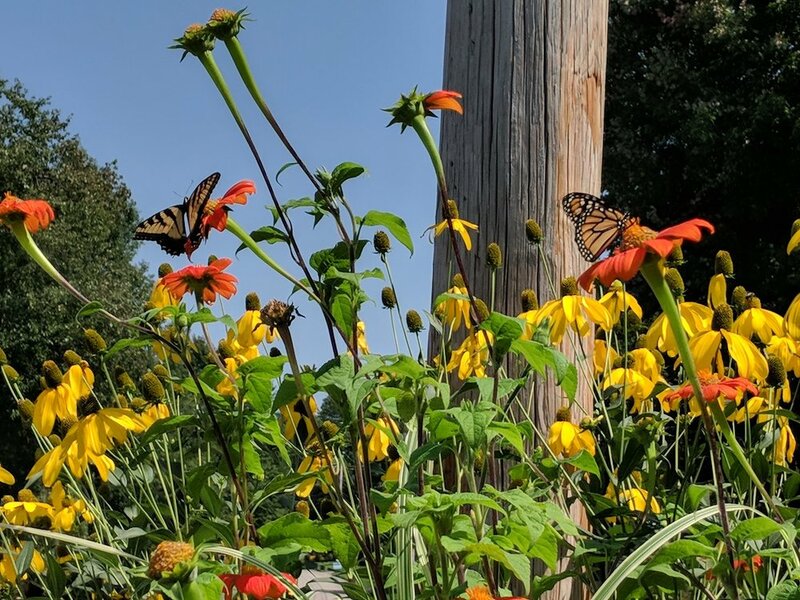 While other annuals and perennial blooms have come and gone, Tithonia just keeps on producing hundreds of blooms which are irresistible to bees and butterflies. Its late-season hardiness ensures a vital food source for pollinators as other nectar sources have dried up. One tithonia plant dominates my mailbox garden which is in full sun. I interplant annual seedlings with Veronicastrum which obediantly bows out just in time for the Tithonia seedling to reach gigantic proportions and take over the role of sustaining native pollinators. By end of summer, my one Tithonia plant is massive and still producing consistent blooms. Bees and butterflies spend the day flitting between this plant and Verbena Bonariensis, planted a few feet away. Dried seed heads are permitted to mature before harvesting for next year’s garden. The Big Little Garden only has one suitable location for Tithonia, and that’s down by the street in what I call my “Mailbox Garden”. It’s full sun, dry and hot. Perfect growing conditions for this hardy annual. Beautiful, easy care and a pollinator magnet - what else do you need? The photo gallery above shows just a few examples of pollinators visiting the cheerful, open blooms of Tithonia. This fantastic annual is not offered by our local nurseries, so I always grow many seedlings in the spring. I only need one seedling and always have many to gift to fellow gardeners. If you are interested in obtaining Tithonia seedlings in the spring and would like to include it or other hard-to-find perennials in your garden, just click the button below!